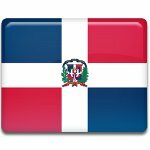 The Dominican Republic celebrates its Independence Day on February 27. On this day in 1844, the Dominican Republic declared its Independence from Haiti. The Dominican Republic occupies the eastern two-thirds of the Caribbean island of Hispaniola, and the remainder of the island’s territory belongs to Haiti. This division dates back to colonial times, when Hispaniola was divided between Spain and France. Until 1795, the eastern two-thirds of the island was a Spanish colony named Santo Domingo, while the western part (Saint-Domingue) belonged to France. In the 1795 Treaty of Basel, Spain ceded its part of Hispaniola to France. In 1804, the French colony of Saint-Domingue proclaimed its independence as the Republic of Haiti. Santo Domingo was ruled by France until 1808, when it was returned to Spanish control with the aid of the United Kingdom. In 1821, it declared its independence as the Republic of Spanish Haiti, but a mere two months later the newly independent state was occupied by Haiti. The Haitian occupation of Santo Domingo lasted for over two decades. Dominicans recall it as a period of brutal military rule. Many landowners were stripped of their property and had to emigrate to the Spanish colonies of Puerto Rico and Cuba, or to Gran Columbia, an independent state that encompassed part of southern Central America and much of northern South America. The Dominican Republic’s struggle for independence from Haiti began in 1838, when Juan Pablo Duarte founded La Trinitaria, a secret society which sought to bring about the end of the Haitian occupation and establish an independent state. At the same time, merchant and politician Buenaventura Báez began negotiations with the French consul to establish a French protectorate in the former Spanish colony of Santo Domingo. To preempt Báez, La Trinitaria declared independence from Haiti on February 27, 1844. The proclamation marked the beginning of an uprising that led to the Dominican War of Independence. The anniversary of the independence proclamation is celebrated as a public holiday, Independence Day of the Dominican Republic. It marks the culmination of the month-long Dominican Carnival. Caribbean Carnival has been celebrated on the island of Hispaniola since the early 16th century, and when the Dominican Republic won its independence, the pre-existing carnival celebrations merged with the Independence Day celebrations, leading to the emergence of the present-day Dominican Carnival. On Independence Day, thousands of people gather in the country’s capital of Santo Domingo for the day-long Carnival parade and street party. Another big parade takes place in La Vega. Smaller parades are held in other cities and towns throughout the country. Most towns have their distinctive costume and mask styles as well as specific characters representing their individual town. Alongside Carnival-themed events, Independence Day is marked with the president’s speech and remembrance ceremonies honoring the heroes of the independence war.